KERA Summer Learning Challenge 2018 | KERA Learn! IMPORTANT NOTE: The 2018 Summer Learning Challenge ended August 9. All completed checklists must be received by Friday, August 31 in order to receive the prize pack. KERA’s 4th annual Summer Learning Challenge provides parents and caregivers with a structured, ready-made plan for making this a fun, educational summer for children. The program includes calendars with daily activities, tips for parents, resources for summer reading and special summer events. Stay updated on upcoming events by checking this page, signing up for the Full STEAM Ahead email newsletter and joining the KERA Summer Learning Challenge Facebook group. All registered children and families are invited to complete the summer activity checklist with a chance to earn cool PBS and KERA Kids books and giveaways. 3. Follow each month’s activity calendar for daily fun and challenges. Get calendar printables, videos and other materials in the resource station below the calendar. The last calendar activity for the 2018 Summer Learning Challenge will be August 9. 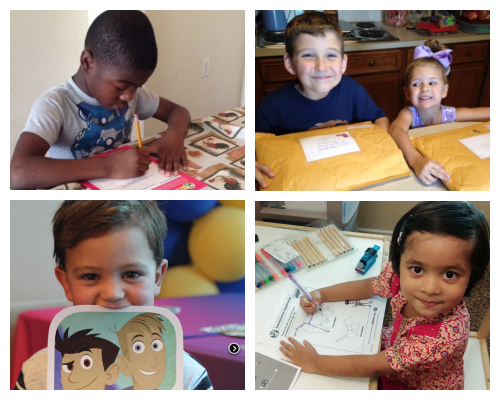 This year, we are focusing on summer reading and fun adventures with PBS Kids characters from Super Why, Nature Cat, Wild Kratts and Splash and Bubbles. As part of The Great American Read initiative from PBS, we’re also launching PBS KIDS Read to help children build habits of reading for pleasure. KERA’s materials include PBS KIDS Read resources along with suggested reading lists and other cool activities from some of your favorite characters. PBS Kids Read materials are located in the resource station below. *Can’t see the calendar above? Click here. Download and print this checklist, then track progress on the 10 listed benchmarks. Upon completion, have each child sign their name, then send the form to us. Your child(ren) will get a KERA STEAM prize pack in return! Download this booklet for educational summer fun. Super Why takes children on a journey of words, language and storytelling. Download this booklet for even more fun anytime, anywhere activities. Download and print this handy chart to keep track of summer reading. » The more adult-focused Great American Read initiative from PBS includes a list of 100 novels. Download this list of recommended children’s books to help build a reading-for-pleasure habit in children, too. » A fun craft: Create your own storytelling cards. » Instill an even deeper appreciation for literature with this list of children’s books about writers and writing. » Kids and dinosaurs go hand-in-hand. Get ideas for books about dinos to read right here. » Little kids love making animal sounds. Check out this list of books about just that — the sounds animals make. » Browse PBS Kids app collections and download your child’s favorites. They have so many, but you can narrow them down by age or skill. You can also download music albums from PBS Kids shows, e-books and even cool smartphone and tablet wallpapers. » Check PBS Parents’ Child Development Tracker, which provides broad guidelines on skills for children ages 2 through 8. Just click on your child’s age and then choose “literacy” to find resources on reading, writing and speaking. The Tracker also has information on development in math, social skills, self-awareness and character. » Sign up for our Start Smart text messages and receive occasional, easy, on-the-spot tips for engaging your young child’s mind. » Are you on Facebook? Join us in the KERA Summer Learning Challenge group for sharing updates, discussion, photos and more. » Explore more teaching and learning resources on KERA Learn. #KERASUMMER — Add to our digital scrapbook! We would love for Summer Learning Challenge participants to send us photos of their families completing activities and challenges. Send pics to [email protected], or post them in our Summer Learning Challenge group on Facebook using the hashtag #KERASUMMER, and we’ll add them to a photo gallery on this page at the end of the season (we’ll share it in the Facebook group, too). View the June calendar here. View the July calendar here. For participants living in the Dallas area, browse children’s and young adult books available for checkout from Dallas public libraries. Learn how to get a Dallas library card here. Join our Facebook group! See photos of families at KERA summer events and participating in SLC activities, and share your own. Questions? Email the KERA Community Engagement Department. Are you a teacher, homeschool parent or other educator? Follow KERA Learn! on Pinterest. Join the KERA Summer Reading Challenge Facebook group. Sign up for the Full STEAM Ahead email newsletter. Sign up for our Start Smart text messages to receive easy tips on engaging with young children.